We are pleased to offer our visitors freshly cooked pizza as we now have a proper wood fired pizza oven, adding even more choice to our restaurant. A wide variety of pizzas is available made to order, with light and fluffy crusts, freshly made tomato sauce and cheese. This is unique to Itambira Island, Seeds of Hope on Lake Bunyonyi. 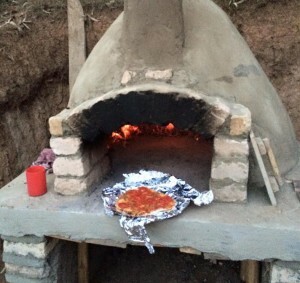 The pizza oven was built and completed in August 2015. Itambira Island offers a unique opportunity to stay on Lake Bunyonyi. Day visitors are welcome to visit our facilities and restaurant, while guests can also book overnight accommodation in treehouses, roundhouses or the house on the hill. Conferences and events are our speciality. Itambira Island is also home to the Seeds of Hope project. Find us and Review us on TripAdvisor! Itambira Island offers friendly and welcoming accommodation for as little or as long as you want. Visit for lunch, dinner or a conference, or else choose to stop a few nights in our fabulous accommodation. We are also home to the Seeds of Hope project with a series of active community and training projects.